The Boston Celtics held their first event of the 2017-18 season Sunday night in the form of an open practice at TD Garden. A select group of season ticket holders were invited to attend, along with some other fans and media. These events are usually relatively quiet affairs, with only a small group of extremely passionate season ticket holders coming out. The attitude Sunday night was totally different. The Garden was far busier than years past, with everyone trying to get a look at all the new signings from the Celtics’ busiest offseason in recent memory. With superstars Kyrie Irving and Gordon Hayward arriving via trade and free agency respectively, there has been a palpable buzz surrounding the Celtics in recent months. The players proceeded with a shoot around and some drills, casually interacting with fans and media along the sidelines. Second-year forward Jaylen Brown documented the occasion from the court on his Instagram story. Cameras were snapping at Hayward and Irving as they took questions from the media for the first time post-training camp. After the shootaround ended, the players looked to give the fans something to cheer for. About half the team started with a game of knockout, with Stevens hopping in the back of the line to get in on the action. Second round pick Jabari Bird finished the competition on top. Next up was a skills competition, which featured a series of dribbling and passing challenges with the longest-tenured Celtic Marcus Smart coming out on top. Finishing off the night’s competitions was a three-point contest between fan favorite center Al Horford and newcomers Tatum and Hayward — offering a first look at their three-point shooting abilities. Hayward was unable to edge out a win in the final few seconds, so Tatum took the title. 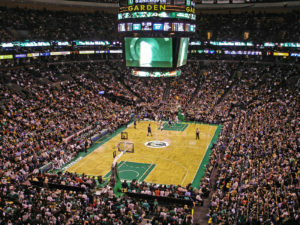 The Celtics’ open practice offered a great preview of the upcoming NBA season. There has been so much change and movement this offseason and expectations are high. If the players have indicated anything, it’s that coming together as one cohesive unit will take time, but ultimately lead to great success.